The Nokia Lumia 800 is the product of collaboration between software giant Microsoft and phone hardware makers Nokia, who came together to home the Windows Phone mobile platform in a beautifully designed mould. While the design of the device is a treat to the eyes, the Mango update to the Windows Phone 7 operating system makes the Lumia 800 a viable choice for you. This Nokia flagship gadget sports a 3.7-inch AMOLED capacitive touchscreen that displays the operating system's tiled look in an impressive way. 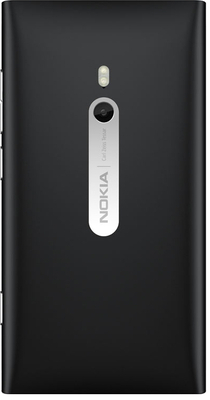 The Lumia 800 boasts of an 8 megapixel camera with features such as Autofocus, 3x Digital Zoom, Carl Zeiss Optics, Dual LED Flash and Geo-tagging give you an enhanced photography experience. You can shoot superior quality videos as the phone supports video recording at 720p HD resolution. Codenamed as the Sea Ray in the initial versions, the Lumia 800 is officially the first device from Nokia to run on Windows Phone 7.5 OS. The phone is powered by a 1.4 GHz Qualcomm Scorpion processorand has 512 MB of RAM. Gaming in this Nokia Windows handset is a fun experience, thanks to the presence of the Adreno 205 GPU. Nokia has infused the ClearBlack technology in Lumia's screen that helps to improve the display quality. The unibody polycarbonate chassis along with Gorilla Glass screen make the Lumia 800 a sturdy phone. There is a line of Windows Phone capacitive buttons below the screen whose tactility augments the user experience. A Lithium-Ion battery of 1450 mAh capacity is present under the hood of the Lumia 800. The battery serves a talk time of 13 hours in 2G and 9 hours in 3G networks. You are ensured of hours of entertainment as the phone has a music playback time of 55 hours and video playback time of 7 hours. The Nokia Lumia comes preloaded with 16 GB of internal memory so that you can store your music, photos and videos without any space crunch. This ergonomically crafted Nokia mobile phone houses the volume rocker, power and camera buttons on its right side for easy access. On the top edge of the device, you will find a 3.5 mm jack, a micro-USB port and a micro SIM card slot while the bottom of the phone is occupied by the speaker grill. The Lumia 800 is packed with regular sensors such as accelerometer, proximity sensor, ambient light sensor and digital compass for your convenience. Internet connectivity on the Nokia Lumia 800 can be easily made through GPRS, EDGE, 3G or Wi-Fi. Thepreinstalled Internet Explorer 9 web browser for mobiles helps you in seamless Internet surfing. You can easily transfer files using USB and Bluetooth connectivity options. There is A-GPS support in this Windows Phone device along with Bing Maps that help you navigate your way easily. The Nokia Music is a music streaming service that is preloaded in the Lumia 800. A free turn-by-turn navigation system called Nokia Drive is also installed on the phone for easier direction finding. With the Microsoft Marketplace playing host to a variety of apps, you can download anything you like on this Nokia Windows Phone device. 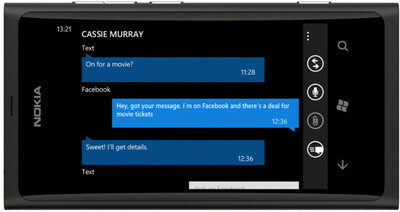 You can connect to your friends and family on the Lumia 800 instantly as it comes loaded with Facebook and Twitter applications. Your professional connections also come live in this device that has preinstalled LinkedIn application. With ActiveSync integration in the Nokia Lumia 800, you can take your office wherever you go. Through ActiveSync, you can receive emails in real time from various ids, all at one place. The Document Viewer and Document Editor help you in checking or making presentations. For further posts of this nature, subscribe to my feed. Do not forget to follow me on twitter (@graciousgarg).